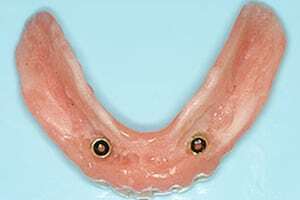 For years, dentists have been making removable complete dentures. But there are problems with removable teeth, and most people who try to use them are dissatisfied. Upper dentures are held in by suction. 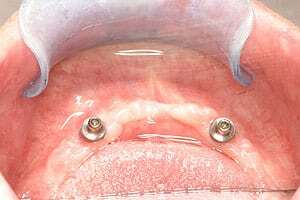 They cover the entire upper palate, and they are designed to press a little harder on the outer edges so that they act like a suction cup. But it doesn’t give a very secure feeling. Any tipping of the denture will break the suction, causing an embarrassing incident and decreasing chewing efficiency. On the lower, the situation is even worse. The removable denture is made to float, and your tongue and cheeks have to be trained to hold it in. After a person has been without teeth for several years, the jawbone begins to shrink. The upper arch flattens out, making it impossible to create a suction cup effect. Chewing efficiency is then reduced to practically nothing, and people have to rely on denture pastes to hold their teeth in. While a complete set of dental implants is the best solution for missing teeth, many people have a hard time fitting that into their budget. An acceptable compromise could be a snap-on denture. Two dental implants are placed in the jawbone near the front of the jaw, as is shown in the picture on the right. 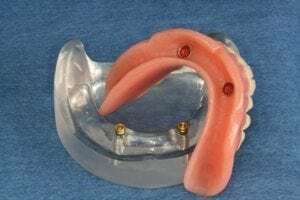 These are fitted with snap-on dentures attachments. The snap-on denture snaps in so that it is reasonably secure, but it can still be removed for cleaning. Most of your normal chewing efficiency will be restored, and you won’t have the worry of loose teeth. And you won’t have the lisp that is associated with loose teeth. There is an O-ring fitted inside that needs to be changed periodically. The patient pictured below is wearing a lower snap-on denture. It is comfortable and secure. The snaps keep it from slipping or falling out, and give him the stability he needs to be able to chew normally. The presence of the implants in the jawbone helps preserve the bone and prevent the facial collapse that occurs with most removable dentures. And, since it only requires the placing of two dental implants, it is very affordable. The photographs below depict a snap-on denture procedure. Dr. Thein placed two ball-top implants and designed a denture that snaps in securely. 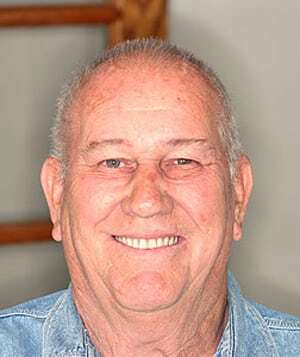 Here is Joe’s new snap-on denture.